Gretzky’s Tears is the latest book by the Globe and Mail’s Stephen Brunt. It examines the controversial trade of Wayne Gretzky from the Oilers to the Los Angeles Kings, almost bringing an end to Edmonton’s Stanley Cup dynasty and launching the National Hockey League’s sputtering Sunbelt Expansion. Brunt is one of Canada’s foremost sports journalists, and one of the best “big picture” writers in the newspaper business today. Unfortunately, Gretzky’s Tears does not meet Brunt’s usually high standards, particularly in contrast to his own body of work and other media on the subject. The closest comparison is Brunt’s previous book, Searching for Bobby Orr, which I reviewed on my old blog . 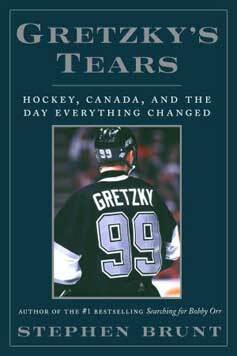 Indeed, in the Acknowledgements section of Gretzky’s Tears Brunt says that it was intended as a sequel to Searching. Both books spotlight the greatest hockey player of their generation, both address the theme of innocence lost and both subjects shy away from the limelight. Orr was always intensely private and Gretzky is big on controlling his own public image. As a result, Brunt was unable to interview either player for his books. Instead, he focuses on interviewing the people around Gretzky and Orr, painting a picture of the circumstances and personalities surrounding these prominent Canadian figures. It was a very effective method in Searching for Bobby Orr, but falls flat in Gretzky’s Tears. The difference is that Orr’s entourage has maintained an omerta-like silence around the former Boston Bruin. Even former business associates like Alan Eagleson and Harry Sinden, both of whom have fallen out with Orr, did not participate in Brunt’s research for Searching. However, in Gretzky’s Tears, two of the principals in the trade, former Oilers owner Peter Pocklington and former Kings owner Bruce McNall, submitted to extensive interviews. The result comes across as a rather jaundiced account of the deal. Pocklington and McNall (and to a lesser extent former Edmonton General Manager Glen Sather) all get to say their piece, wheras Brunt, and therefore the reader, are left to guess at Gretzky’s state of mind before and after the move. This would be fine if Gretzky’s Tears was created in a vacuum. Unfortunately for Brunt, Pocklington wrote (with the help of Terry McConnell and J’Lyn Nye) a book of his own called I’d Trade Him Again that includes a forward by the Great One. Worse yet, ESPN’s 30-for-30 documentary Kings Ransom also looks at the trade and filmmaker Peter Berg spoke extensively with Gretzky. A smaller problem with the book is that it seems as though the editors backed off of Brunt’s copy. This might be because of the success of Searching for Bobby Orr, but Gretzky’s Tears suffers without a firm guiding hand. The first chapter of Gretzky’s Tears is a ponderous exploration of loss of innocence that could have been cut completely. Further, Brunt has, for whatever reason, begun to copy sentences from one chapter to the next almost verbatim. For example, towards the end of the book Brunt discusses Canada’s Olympic gold medal in 2002 and the rousing speech Greztky made at a press conference early in the games. I only used excerpts, but aside from sentence structure the passages are almost identical. It’s not an isolated incident either. There are several paragraphs throughout the book that repeat information and use similar phrasing. It’s a distracting habit and one that Brunt or his editor should have picked up on. And that is the most disappointing thing about this book. Stephen Brunt is an excellent writer who, in my opinion, is one of the best sports columnists in Canada. Searching for Bobby Orr was thoroughly researched and did a wonderful job of explaining the magic of Orr. On the other hand, Gretzky’s Tears is a flawed book that suffers by comparison to Brunt’s earlier work and the work of others. By any other author this would be a solid book, but Brunt is a victim of his own success.